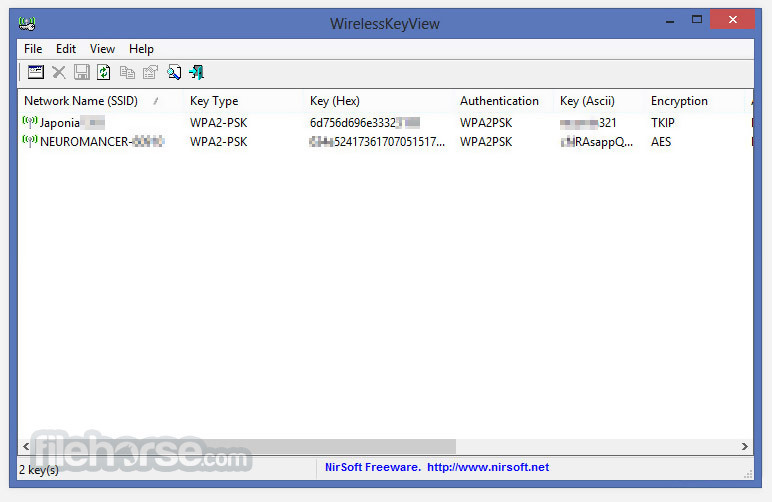 WirelessKeyView 通過 Windows XP 的“無線零配置”服務或 Windows Vista，Windows 7，Windows 8，Windows 10 的“WLAN AutoConfig”服務恢復存儲在計算機中的所有無線網絡安全密鑰 / 密碼（WEP / WPA）和 Windows Server 2008. 它允許您輕鬆地將所有密鑰保存到 text / html / xml 文件，或將單個密鑰複製到剪貼板。您還可以將無線密鑰導出到一個文件中，並將這些密鑰導入到另一台計算機中. WirelessKeyView 不需要任何安裝過程或其他 DLL 文件。只需將可執行文件（WirelessKeyView.exe）複製到您喜歡的任何文件夾，然後運行即可。＆nbsp; 運行後，主窗口應顯示 Windows“無線零配置”服務存儲在計算機中的所有 WEP / WPA 密鑰。對於 WEP 密鑰，密鑰也以 Ascii 形式顯示。請注意，此實用程序只能顯示 Windows 操作系統存儲的網絡密鑰。它不能恢復任何其他第三方軟件存儲的網絡密鑰. - Added command-line options to modify the settings of 'Advanced Options' window, for example: WirelessKeyView.exe /LoadFrom 2 /ExternalWinDir "J:Windows" /WlansvcFolder "J:ProgramDataMicrosoftWlansvcProfiles" /scomma "c:tempwk1.csv"
- Added 'Advanced external drive settings' option, which allows you to choose the Windows protect folder and the Registry hives folder. - WirelessKeyView now supports 2 methods for decrypting the wireless keys of the current running system. If from some reason the default method doesn't work on your system, you can choose the other one.